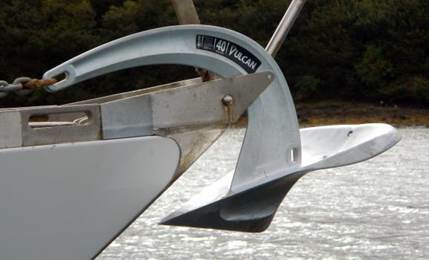 Rocna’s new Vulcan anchor is the latest addition to the modern scoop type anchors. Incorporating elements from several of its forebears, Peter Smith (originator or the Rocna) designed it specifically for larger powerboats, which have hitherto often been unable to accommodate a modern scoop type anchor. One factor that made the Rocna difficult to use on some boats was its roll bar. This was to facilitate the anchor orientating itself correctly when it landed on the bottom. Anchors like the Spade and Ultra overcame this with heavily weighted fluke tips, a design element incorporated in the Vulcan, obviating the need for the roll bar. To enable that anchor to better fit the power boat’s bow roller, Peter designed a curved shank reminiscent of Alain Poireau’s Oceán anchor. The large wide sugar scoop-like back end of the fluke provides a uniquely large surface area. All together these elements clearly make this a good anchor for both hard sand and soft mud. 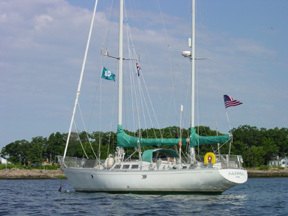 Given the opportunity, we were indeed delighted to take it out for a cruise – on our sailboat. With its pedigree, the Vulcan did not disappoint. On our first attempt at using it, we dropped it down on hard white sand in 15 feet of crystal clear aqua blue water off a remote island on the west coast of Ireland. As our boat veered off the wind, we let out 30 foot of chain and watched the big anchor fluke lying on the bottom next to our boat. With less than 2-1 scope we were pleasantly surprised when the chain straightened out and the anchor bit, disappearing into the sand. When our boat straightened out somewhat we let out some more chain snubbing it again at 50 feet, or just under 3-1 scope, allowing for our bow height over the water. To see what would happen, we put the engine into reverse, a little at first and then more power. When the chain straightened out the boat came to a shuddering stop. She didn’t budge. All that then remained was to let out sufficient rode to bring us to a 5-1+ scope, allowing for the 12 foot tide rise, and then to relax. We had quite similar experiences in both soft sand (mud/sand mix) and soft mud. The only difference was, as expected, that as we powered in reverse, there was not quite as sudden a stop when the chain straightened out. Instead the anchor dug deep. In the muddy bottom it dug very deep and we had to be patient when it came to weighing anchor. The Vulcan anchor is available from Canada Metal, exclusive manufacturer and licensee of the Rocna brand, and from their distributors and chandleries worldwide (www.rocna.com).